Theora Converter .NET is a Windows desktop application that batch converts almost any video files (including mp4 & h264) to OGG / OGV ( Theora ) format. Theora Converter .NET is a Windows desktop application that batch converts almost any video files (including mp4 & h264) to OGG / OGV ( Theora ) format. Provides a graphical user interface for based on GFrontEnd. Supports two pass theora encoding. Added additional resolutions: 180, 272 to the video resolution height drop down. Added text to the tooltip about entering custom resolutions in the video size fields. Copy the top level folder name from the source-folder to the destination-folder. 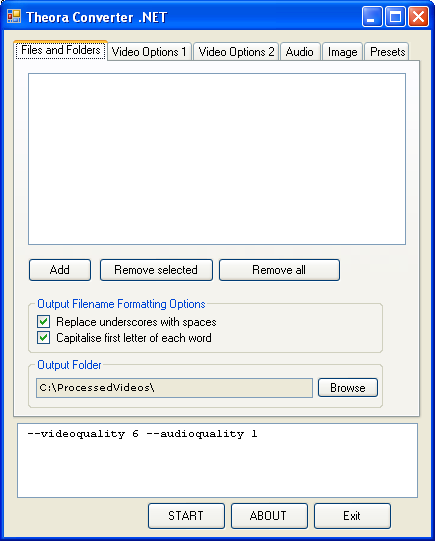 Title the command windows with the name of the file being processed by ffmpeg2theora.